In 2010, NASA called a press conference to make one of the biggest announcements in scientific history: researchers had discovered an unusually hardy bacterium that could not only tolerate exposure to arsenic, but actually incorporate the poisonous element into its DNA. The team's findings, if correct, would have gone against some of the most widely accepted principles in science, marking a paradigm shift in the fields of biology and evolution. Now, a year and a half later, two other teams have published findings that refute the arsenic findings outright. The original "arseniclife" findings were published in the journal Science in 2010, by a team of researchers funded by NASA and led by Felisa Wolfe-Simon. 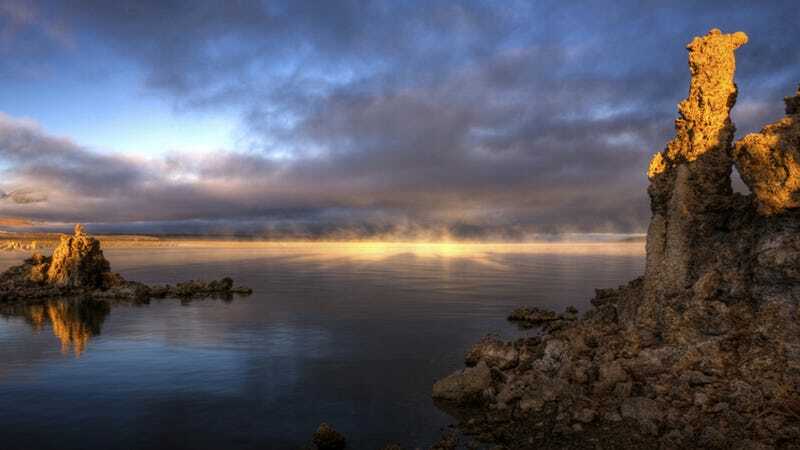 The paper, which you can access here, reported that Wolfe-Simon and her colleagues had found a strain of bacterium in California's Mono Lake — pictured up top — capable of replacing the phosphorous in its DNA with arsenic. Phosphorus is considered one of the six essential building blocks of life, the others being oxygen, carbon, hydrogen, nitrogen and sulfur. The discovery of an organism that could eschew phosphorous in favor of another element (let alone arsenic, which is usually poisonous) would have redefined our concept of what life is, and what kinds of life are possible. "GFAJ-1 cells growing in Mono Lake face the challenge of discriminating an essential [phosphate-containing salt] from a highly abundant but toxic [arsenic-containing mimic]," report Redfield and her colleagues. These circumstances aren't unique to bacteria living in Mono Lake, by the way. Plenty of other microorganisms face similar challenges, including "those growing in environments with scarce potassium and plentiful ammonia." Tobias Erb, lead author of the second study, draws similar conclusions, noting that GFAJ-1, while arsenate-resistant, is "still a phosphate-dependent bacterium." Taken together, the research papers refute the controversial claims published in Science just 19 months ago. "Contrary to an original report, the new research clearly shows that the bacterium, GFAJ-1, cannot substitute arsenic for phosphorus to survive," the magazine explained in a statement. "[GFAJ-1 is] a well-adapted extremophile that lives in a high-arsenic environment," and "is likely adept at scavenging phosphate under harsh conditions, which would help to explain why it can grow even when arsenic is present within the cells." When asked to comment, Wolfe-Simon told the AFP that the data in the newly published papers "are consistent with our original paper" and that new data is forthcoming. "A great thing about science," she explained, "is that the ability to do rigorous tests with controls provides an increasingly accurate knowledge of life and the universe that is extremely useful. The two newly published articles appear in this week's issue of Science, and are available online here and here.